The Eleventh Session of the UN Forum on Minority Issues is convened on 29 and 30 November 2018 pursuant to Human Rights Council resolution 6/15 of 28 September 2007 and resolution 19/23 of 23 March 2012. A Preparatory Meeting for all participants has been held on 28November 2018 from 10 a.m. to 13:00 in Palais des Nations Room VII. During the Preparatory Meeting the participators has agreed with UN Special Rapporteur on minority issues that the 2019 UN session on minority issue titled as “Mother Tongue”. This year’s Forum is convened on the theme “Statelessness: A Minority Issue”. Statelessness is a human rights issue disproportionately affecting minorities around the world. The UN officials has decided the name of “Forum” need to be changed to “Platform” from next year, in which the participants will recommend a proposal, and their recommendations to be implemented in real work for the United Nations programme. 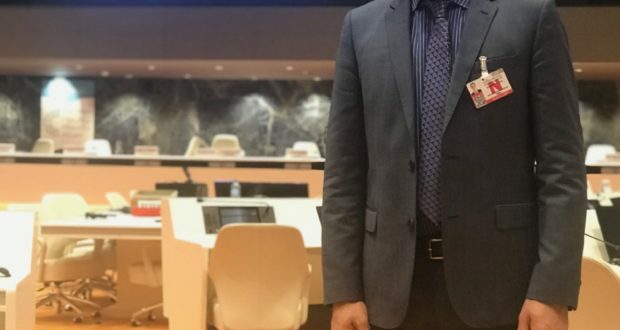 Faisal Maramazi the executive director of Ahwazi Centre for Human Rights (ACHR) has represent the centre in the mentioned UN session. Mr. Maramazi during the session, talked about the causes of statelessness and the negative effects of immigration on Ahwazi women and children. While 600 persons has been registered for the current session, the Ahwazi centre has got two participations in the Palais de Nations on 29-30 of November 2018. Finally, all the participators’ recommendations been written by the UN Special Rapporteur on minority issues Mr. Fernand De Varennes and will submit them to the 40thsession of UN human rights council that is going to be held in March 2019 in Geneva. The Ahwazi centre has prepared following words for the Eleventh Session of the UN Forum on Minority Issues. In all the world countries, the attention and concentration are at its high level for the future of the most important element in development and civilization, namely the child. Advanced hospitals are built to receive pregnant mothers and then provide medical services for the child and study in various stages to create generations that boast the nations scientifically towards development. But in Iran, the situation is very different, especially for the Ahwazi children. Life is different there, standards are reversed and attention is to be bury the skills before they appear. Mothers do not receive proper health services. Most births are Caesarean births instead of natural birth. The child comes hard to the world to face complex situations, especially economic and political and security conditions. The schools are very few and the architecture is low and the educational staff are mainly Persian, hate the Arabs student in Iran. In schools, which are supposed to be the first building blocks for the preparation of the child, schools are often a repulsive environment. Where the Ahwazi child encounter at first with the barrier of the Persian language, which is ignorant and then the cruelty of teachers. The Ahwazi child speaks Arabic language, while it is mandatory to speak and learn in Persian only. The result is catastrophic by all standards, with Ahwazi children starting to drop out of primary school by 30% and reaching more than 70% in secondary school. Many of the Ahwazi children goes to work at a very young age, in a stressful work and acts that are humiliating for the mass Ahwazi children. The Ahwazi children are facing dark future due to Iranian regime ignorance for the children need. 30 thousand Ahwazi children did not go to nursery for not investing budget for the school infrastructure. The Ahwazi children death toll rises every day, the death caused by Iranian police shooting like “Raghad Sawari” or sewage or river water. This matter is not limited to the Ahwazi Arabs children, but also for the children of the Baluchistan and South Azerbaijan as well as Kurdistan and Turkmen, where children and their parents suffer from all forms of Iranian occupation authority’s violations that internationally prohibited. I appeal to you with Ahwazi children wishes and what you wish for your children, to extend a helping hand to the Ahwazi children and all children in the geography of Iran, for children while they born are deprived from seeing their father and mother that are in prison. I appeal to you to stand up to the Ahwazi children and all Iran and say to the Iranian terrorist regime, it is enough to use children in your terrorist militias and to engage them in the wars in Iraq, Syria and Yemen, enough to spread the distinction, among children.